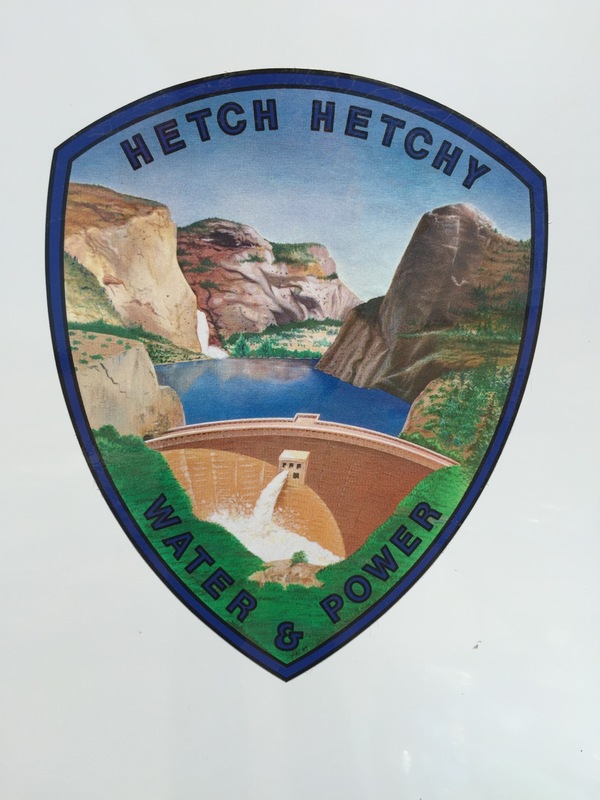 Hetch Hetchy Water & Power supplies water and power to the City of San Francisco, CA. 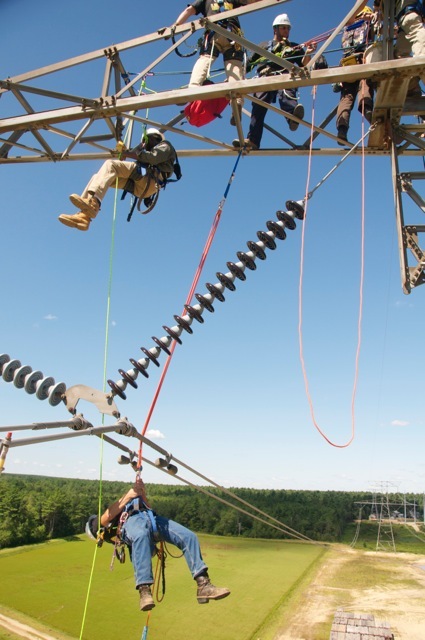 Linemen for the transmission department received rope rescue training in June of 2015 from RTR. 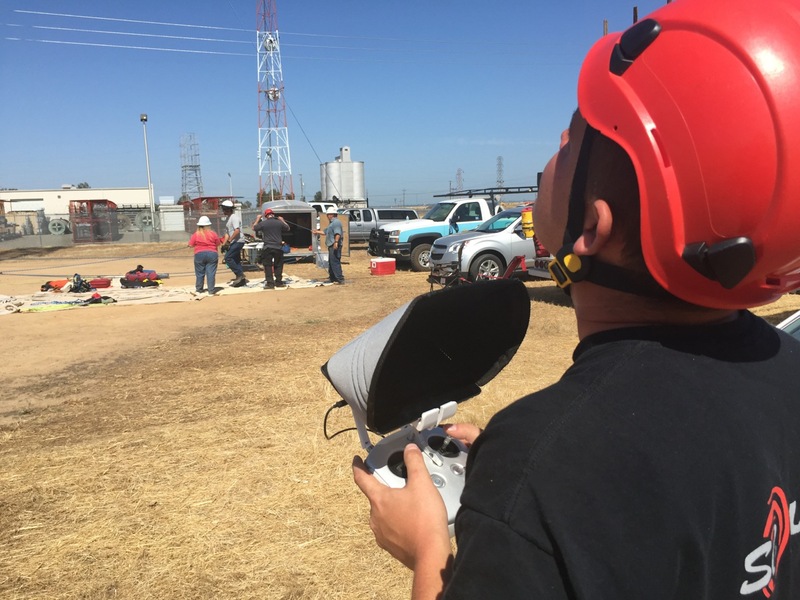 RFO Industries drone filming our RTR Training! 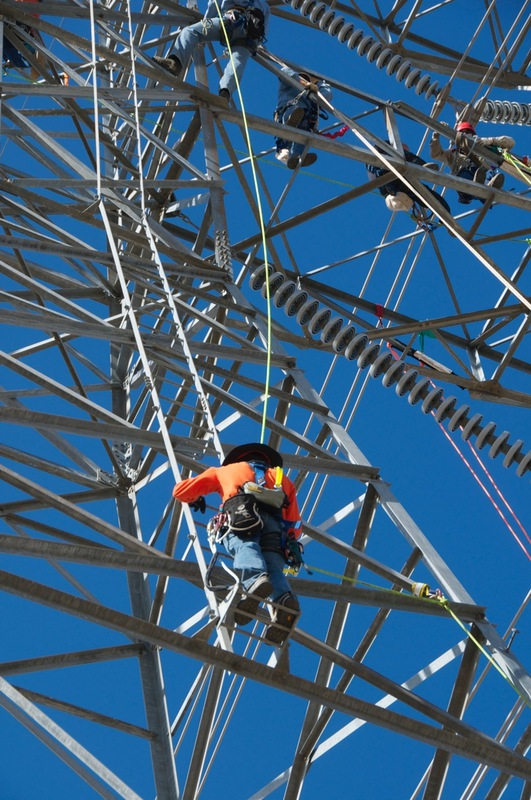 HHW&P linemen working on WAPA 500kv tower near Elverta, California. 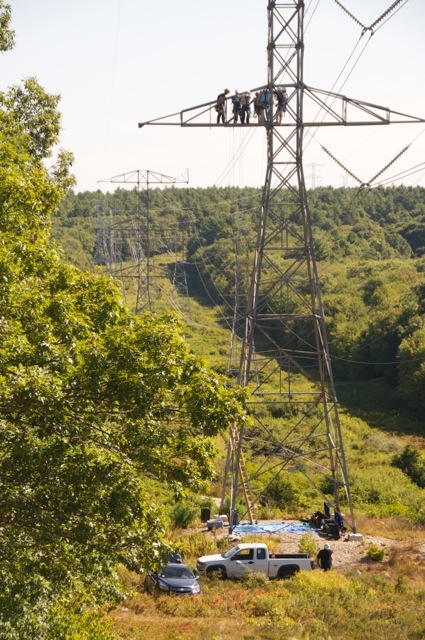 Notice the RFO Industries drone flying to the left of the tower where linemen are performing multiple structure-based rescues. 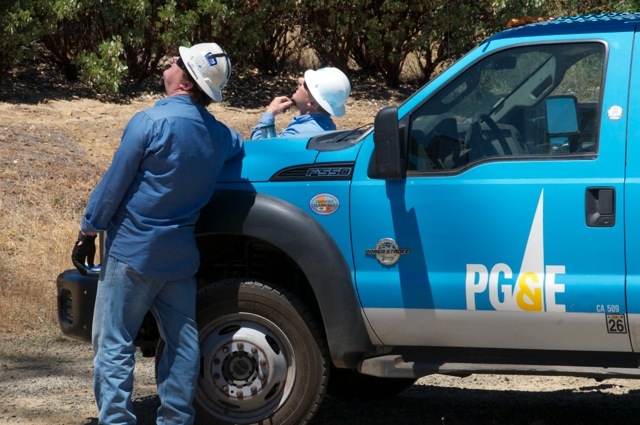 This drone was operated by Kevin Ogg from HHW&P. His company is RFO Industries and is at www.rfoindustries.com See their web site. 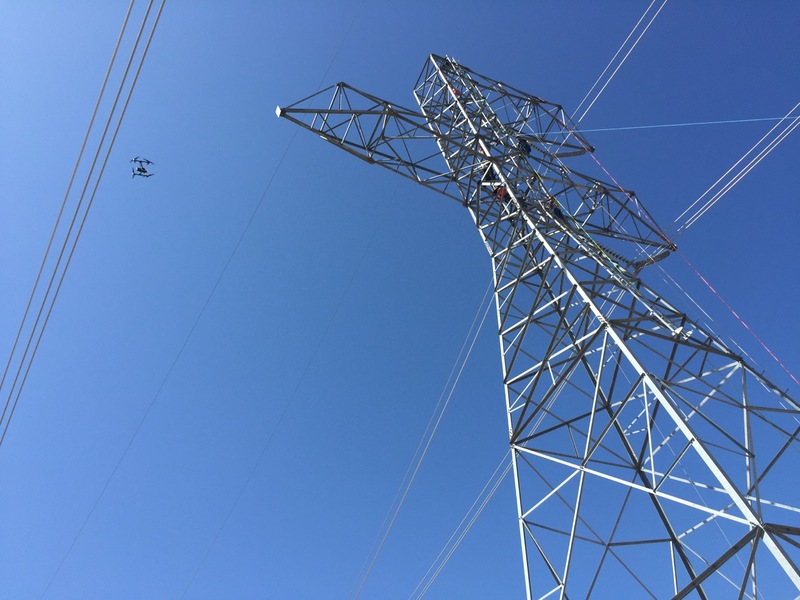 This drone was operated by Kevin Ogg from HHW&P. His company is RFO Industries and is at www.rfoindustries.com See their web site. 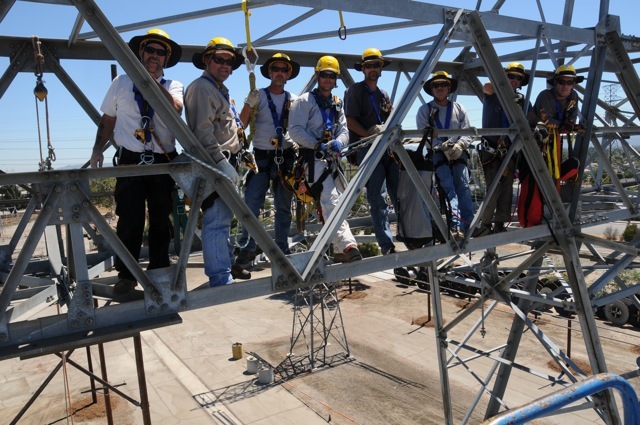 Hetch Hetchy Water & Power (City of San Francisco) transmission linemen working with RTR Senior Instructor, Reed Thorne (far left) on structure-based tower rescue techniques. Taken from Kevin Ogg's drone. Company name: RFO Industries. 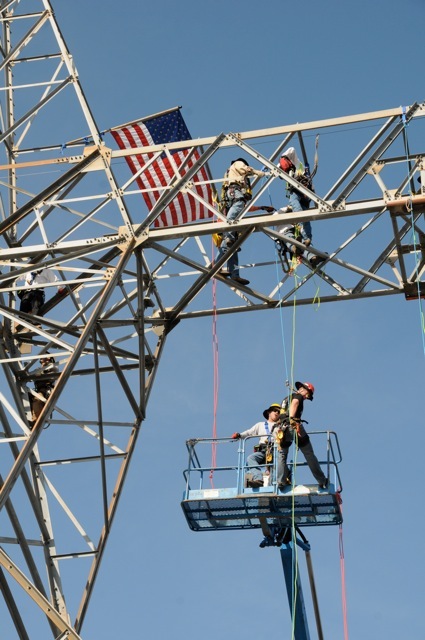 Hetch Hetchy Water & Power (City of San Francisco) transmission linemen working with RTR Senior Instructor, Reed Thorne (far right) on structure-based tower rescue techniques. Taken from Kevin Ogg's drone. Company name: RFO Industries. 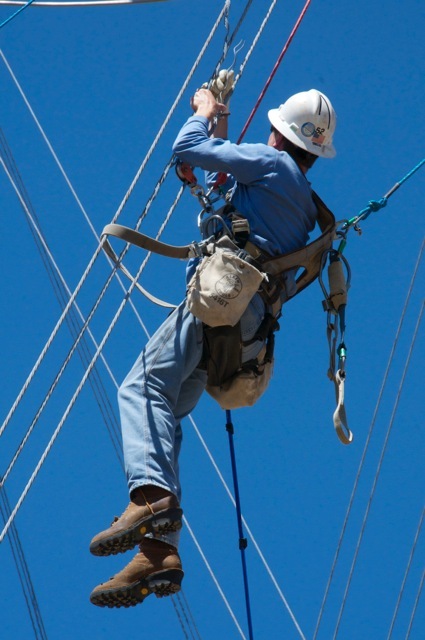 Hetch Hetchy Water & Power (City of San Francisco) transmission linemen Troy Harris walking the bundled conductor. Taken from Kevin Ogg's drone. 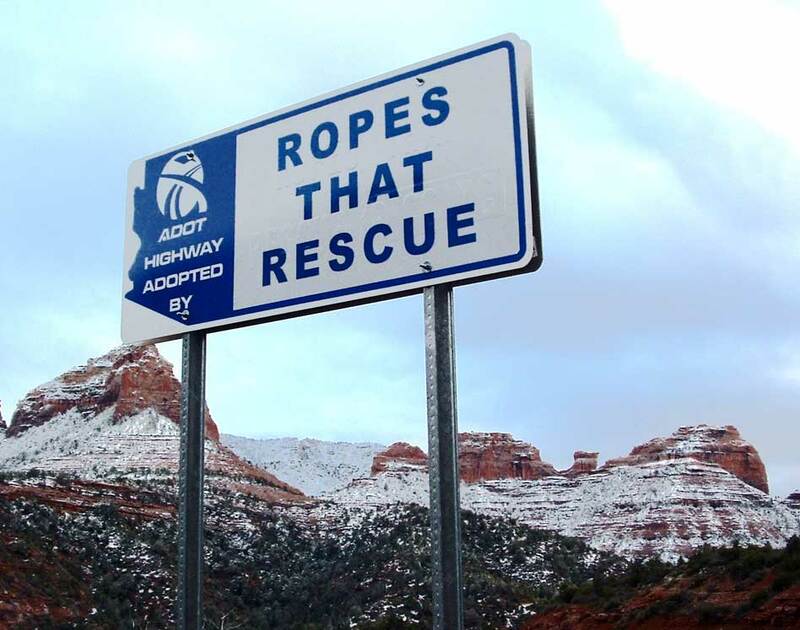 Company name: RFO Industries. 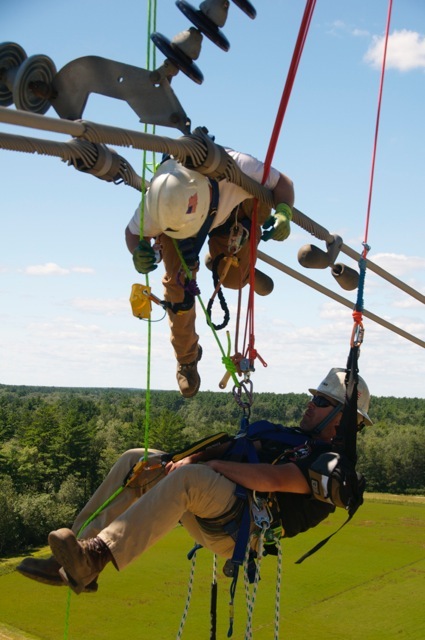 One example of our final day ground-based tower rescue procedure: the skate block. 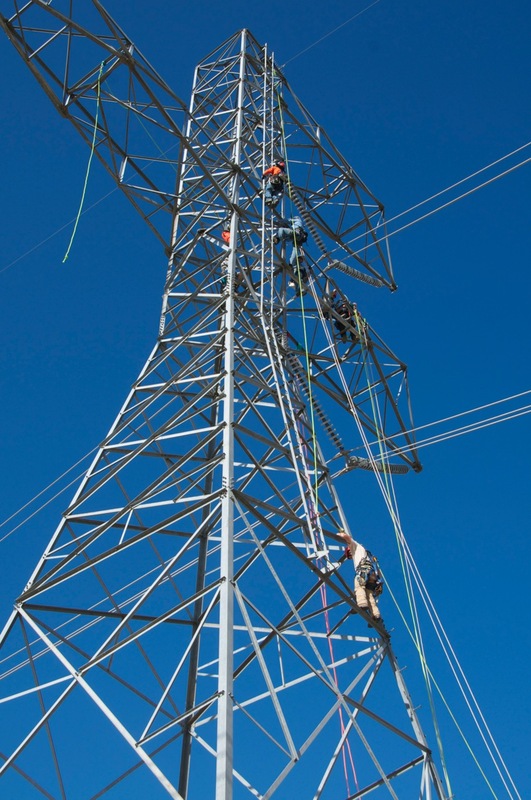 HHW&P linemen up on the WAPA 500kv tower in Elverta, CA for RTR training. 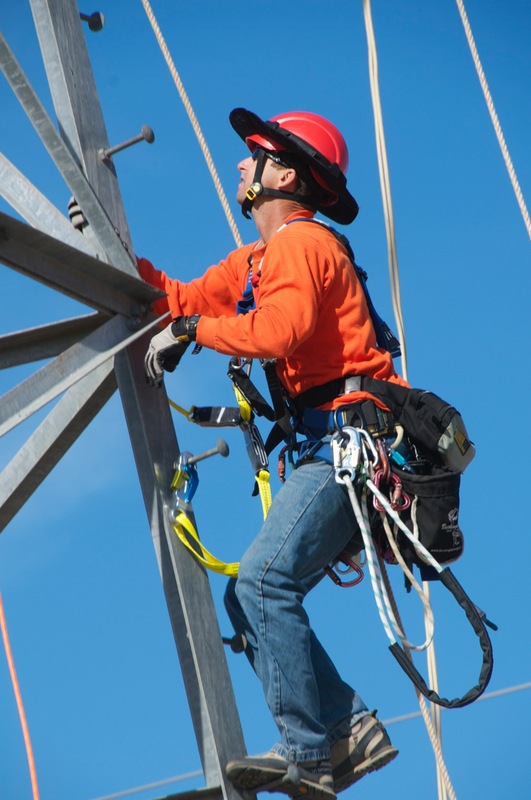 HHW&P Troy Harris using new tools for climbing a lattice steel transmission structure. 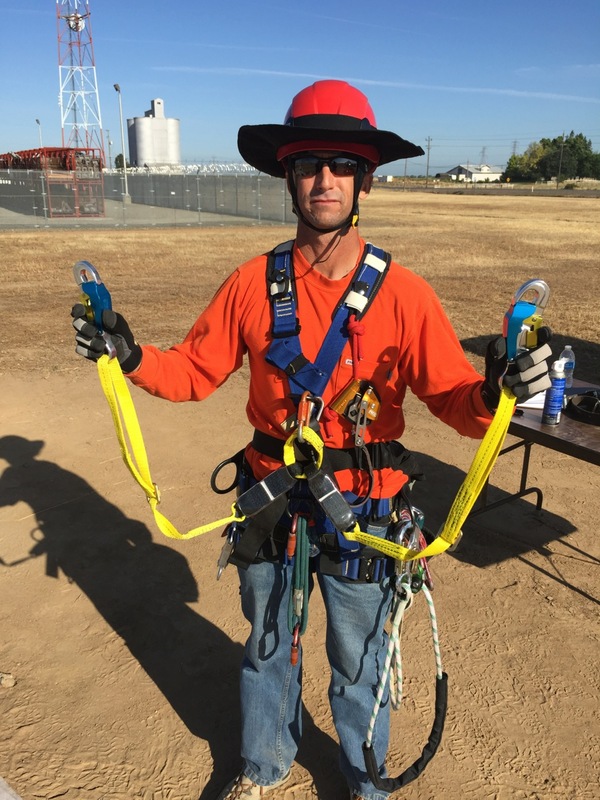 HHW&P lineman, Troy Harris, with double lanyard step clip system attached to sternal D ring. 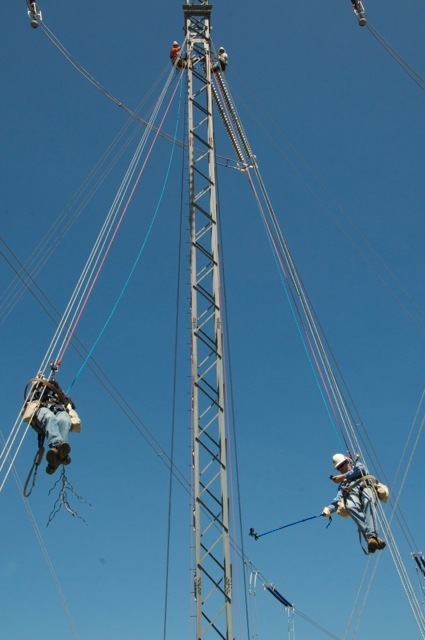 The class concentrated on differing means of 100% tie off on steel lattice towers. 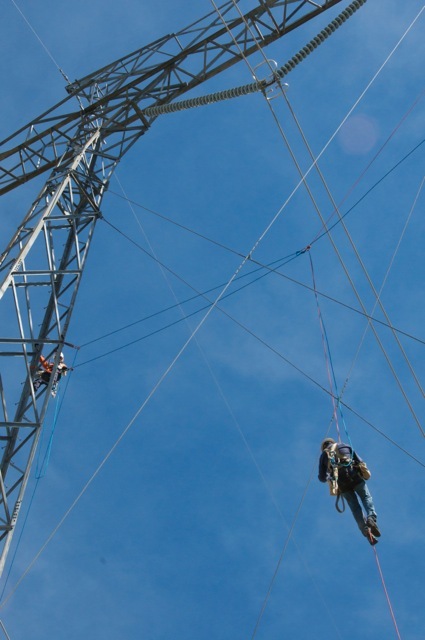 PG&E Tower Crews here using rope access techniques developed by RTR for accessing the mid guy intersections on 500kv transmissionn lines near Round Mountain (Redding) California in 2014. 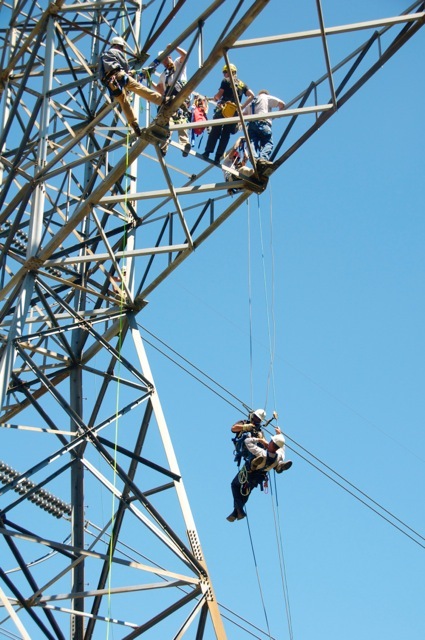 PG&E Tower Crews here using rope access techniques developed by RTR for accessing down guys on dead end 500kv transmissionn lines near Round Mountain Substation (Redding) California in 2014. 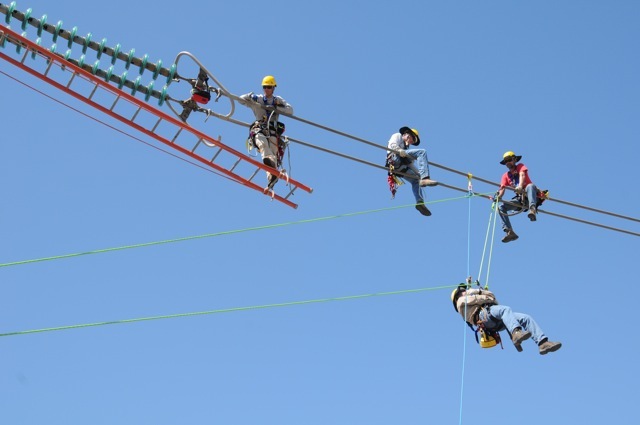 It does not get much more fun than this with linemen! 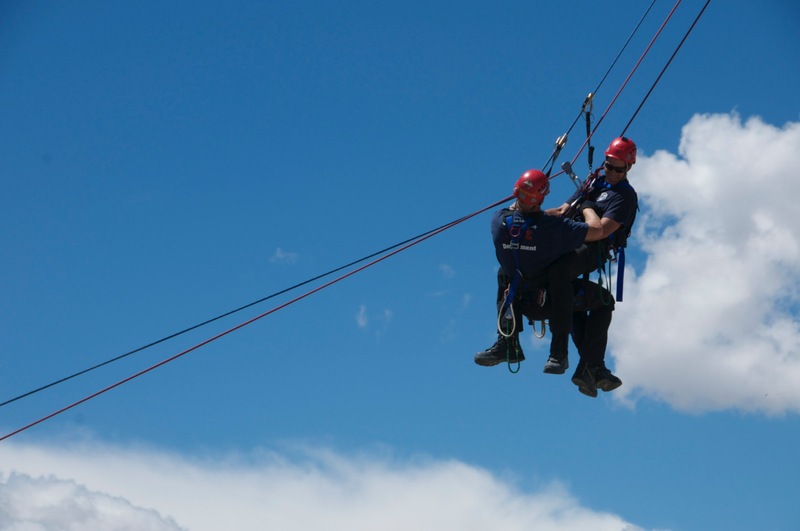 RTR Assistant Instructor, Keith Thorne co-instructed this workshop in 2013 and 2014 with father, Reed Thorne. 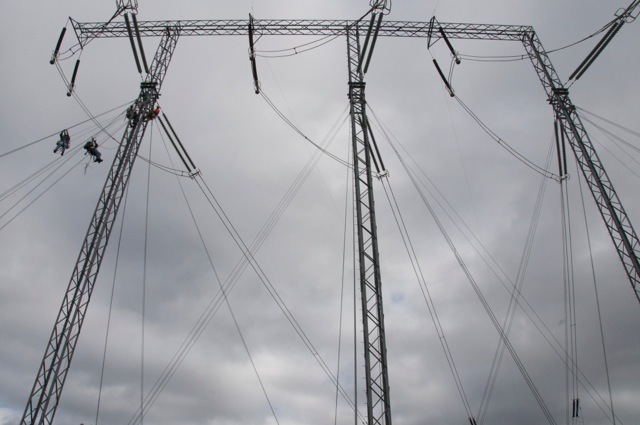 Fun towers to work on as one side is not energized! 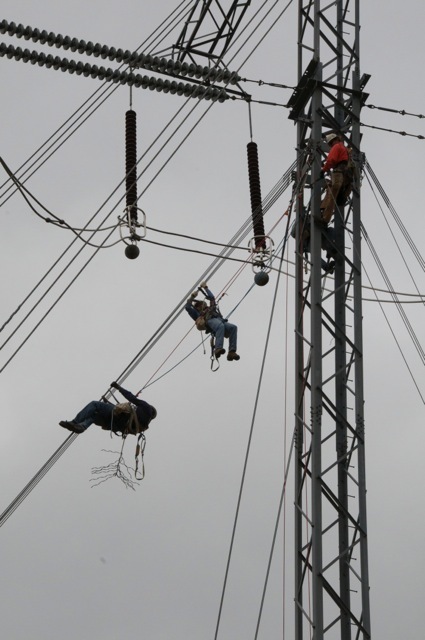 NSTAR linemen having a BLAST training! 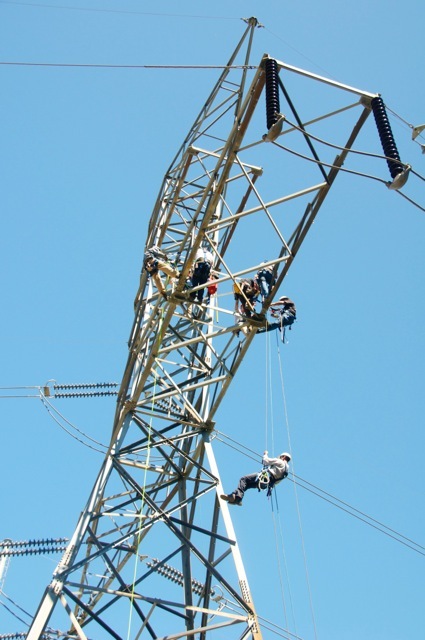 NSTAR lineman reaching down below conductor to perform rescue. 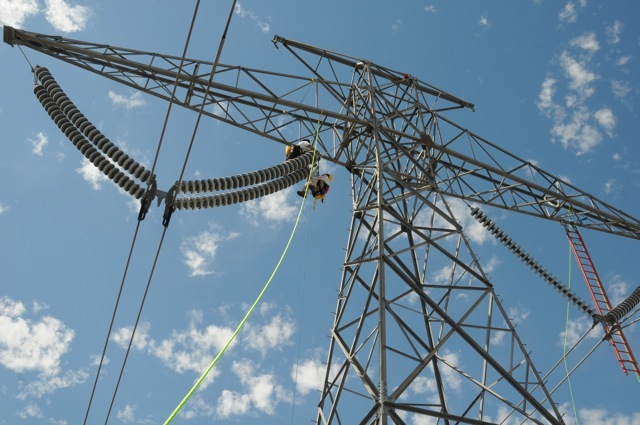 Uses AZTEK to pick them off the wire, then lower. 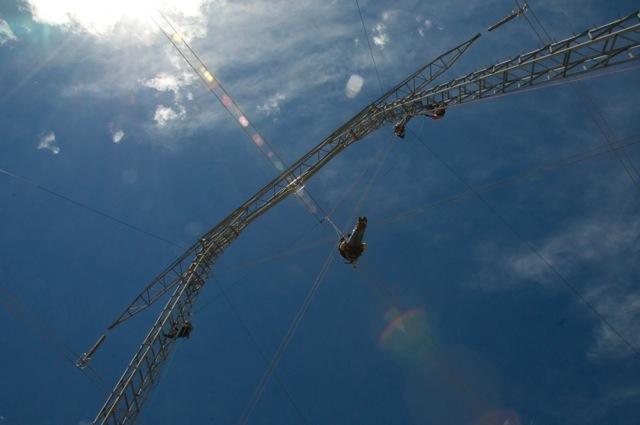 RTR Assistant Instructor, Keith Thorne arrives at the top of the 40' pole. He looks very comfortable up there. 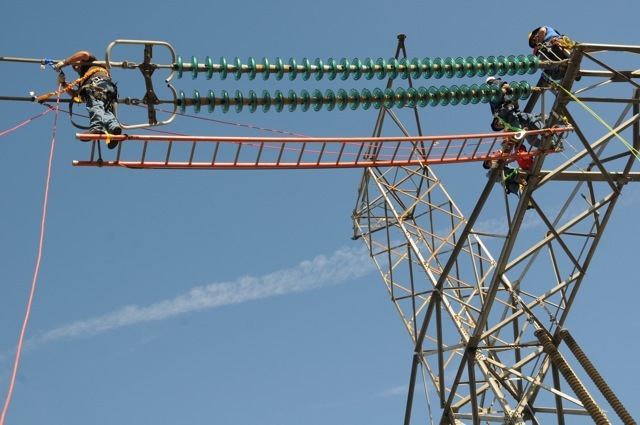 Now the climb down! 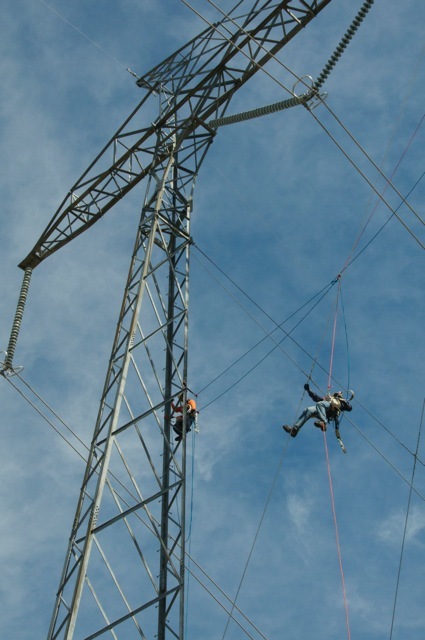 Keith on his first pole climb! 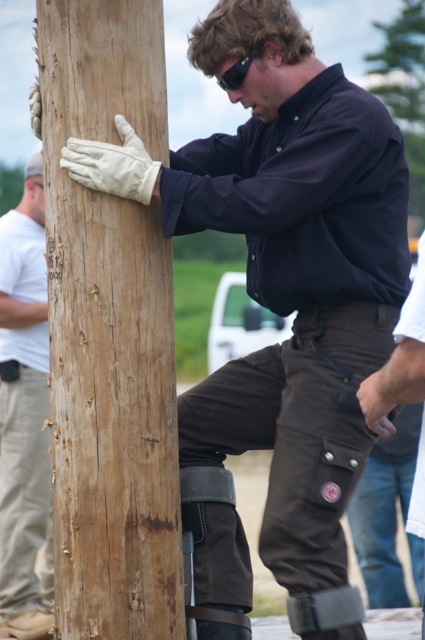 NSTAR linemen convinced RTR Assistant Instructor, Keith Thorne to put on the hooks and the belt and climb his first pole. 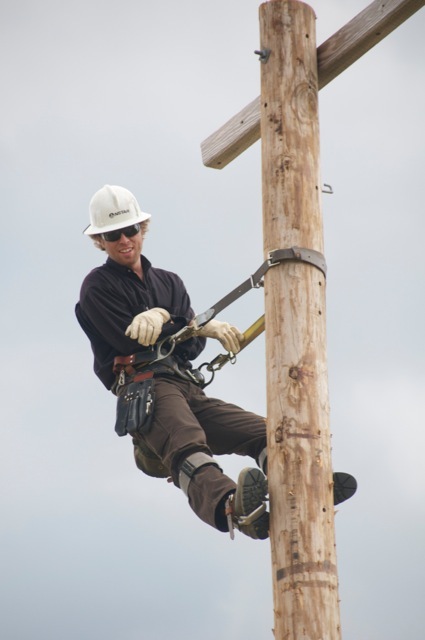 After watching him, they said he was better his first time than many seasoned linemen on the job for more than ten years! Way to go, Keith! 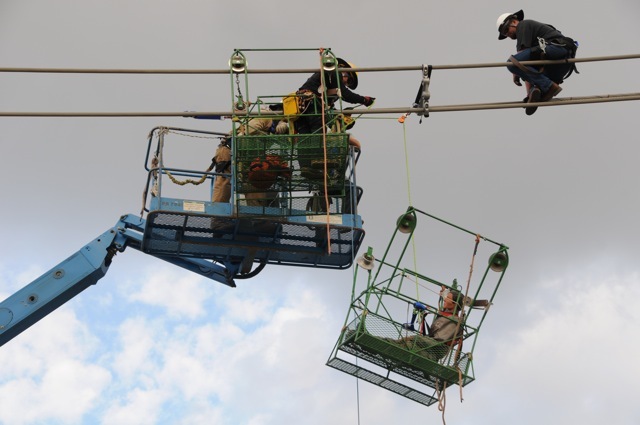 Here, RTR Assistant Instructor, Keith Thorne is above on arm making sure linemen are hooking up correctly and doing safety, while Reed Thorne is in bucket truck watchig men doing the rescues. 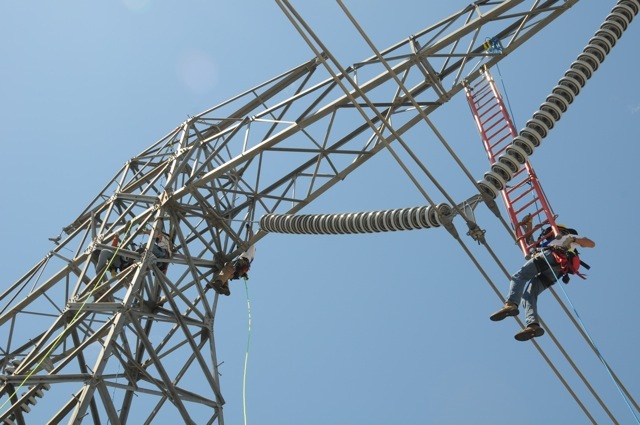 Crews from LADWP are responsible for over 1,200 circuit miles of EHV DC (extra high voltage direct current) bulk power transmission lines running from Oregon and Utah to the city of Los Angeles. 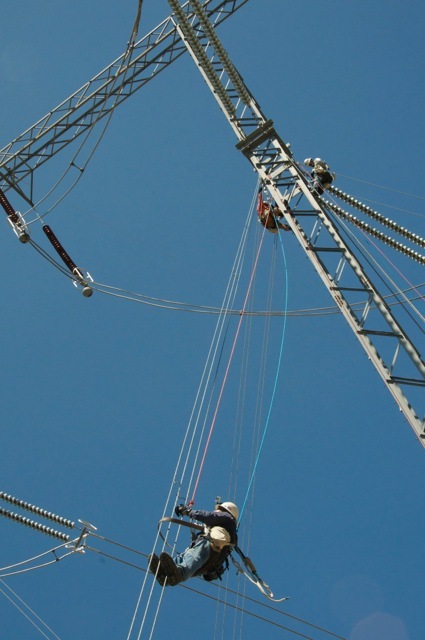 Both lines are 2312 conductor in either twin bundle or tri-bundle configuration. 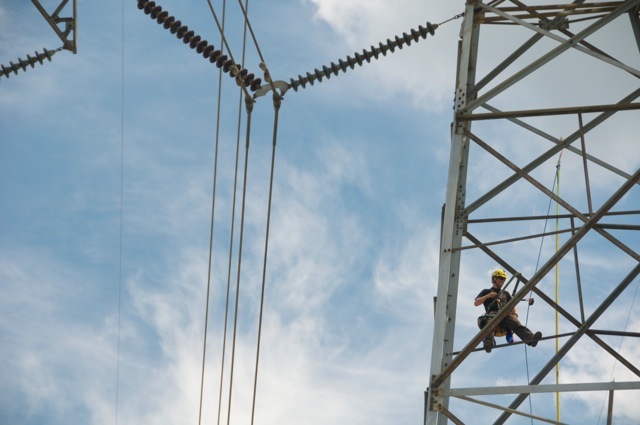 Every year, each of these important bulk power lines are shut down for a period of one full week to allow LADWP crews to maintain hardware, insulators and spacers. 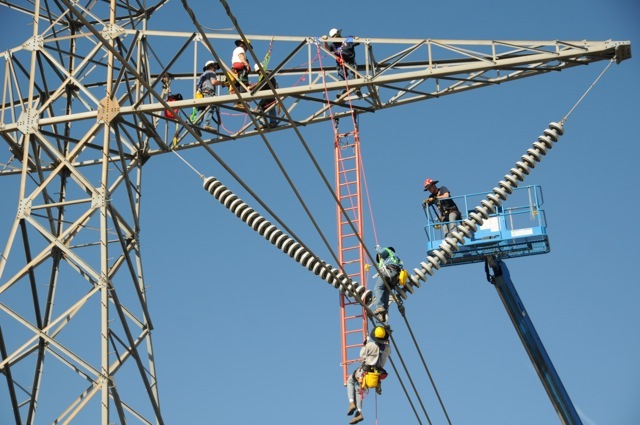 All of this work for spacing is done by hand in spacer carts, or "buggies", and not by helicopter. 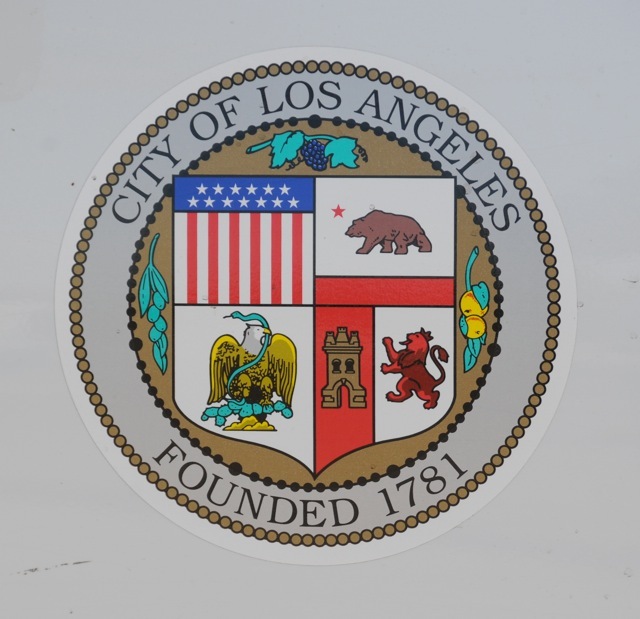 So, as a result, LADWP was keen on developing a cart rescue plan which would allow a second cart to be launched with rescue retrieval rope and hardware. 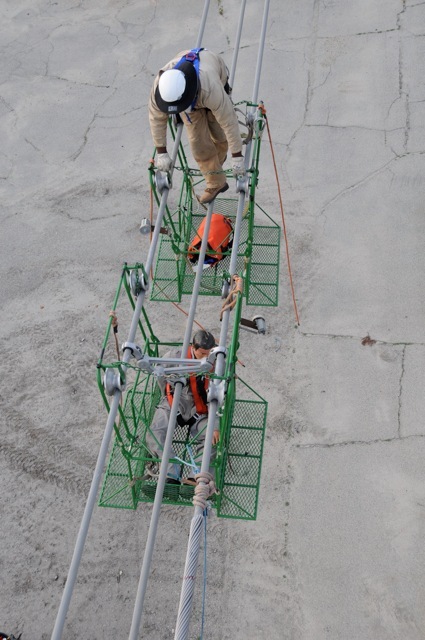 These photos show some of the work done to facilitate this type of structure-based cart rescue. 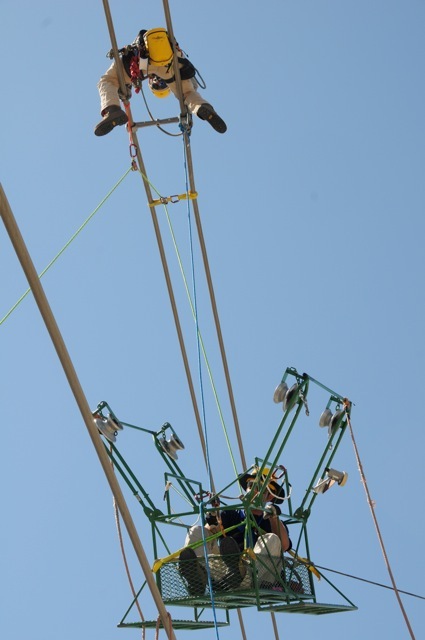 A manikin was used to simulate the victim being lowered from the conductor bundle still within the cart to the ground. 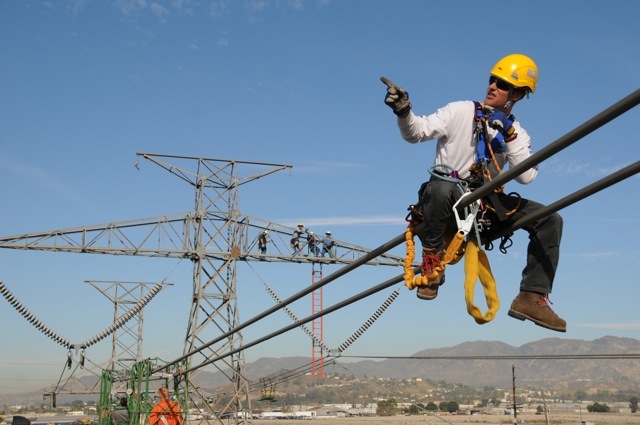 Linemen from LADWP performing mid span rescue of coworker suspended from conductor. 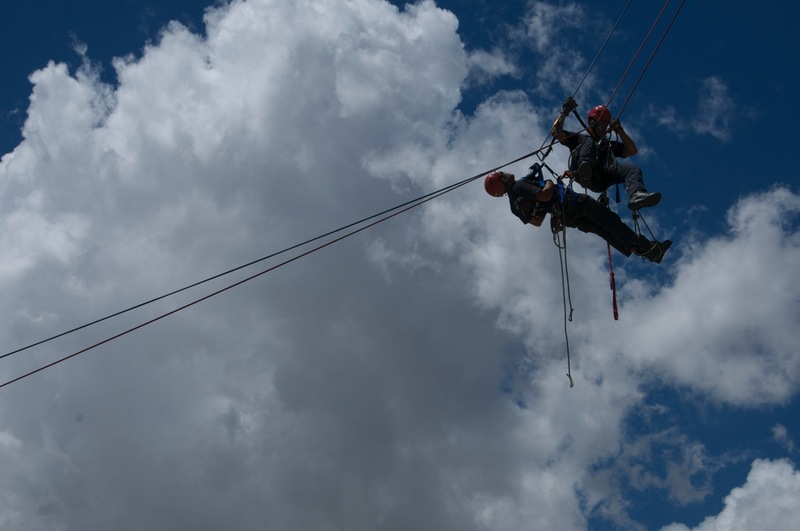 A second blue safety line was used in all training as a backup to the main line used for rescue. 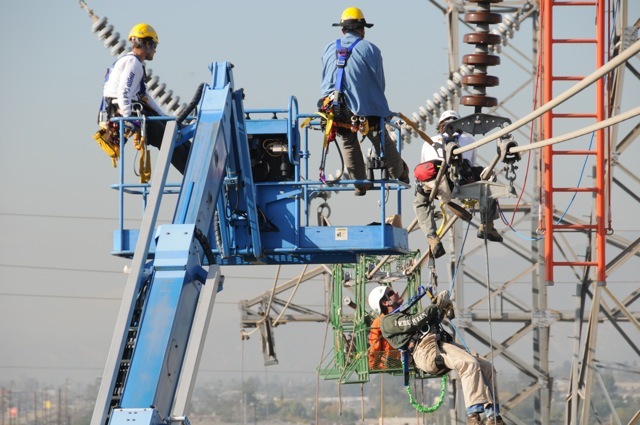 Linemen from LADWP performing mid span rescue of coworker within a conductor buggy while instructors look on. 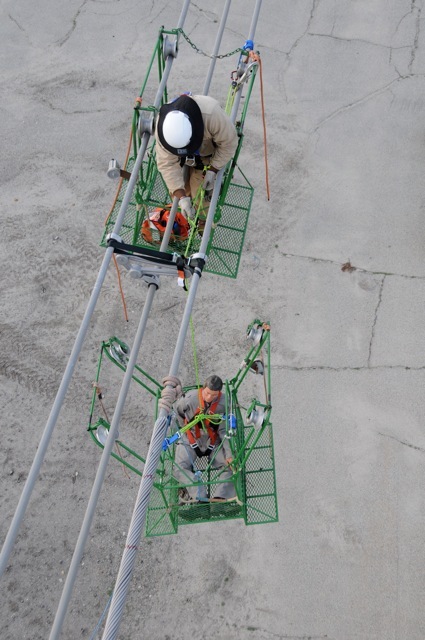 A manikin was used within the cart to simulate the victim needing rescue. 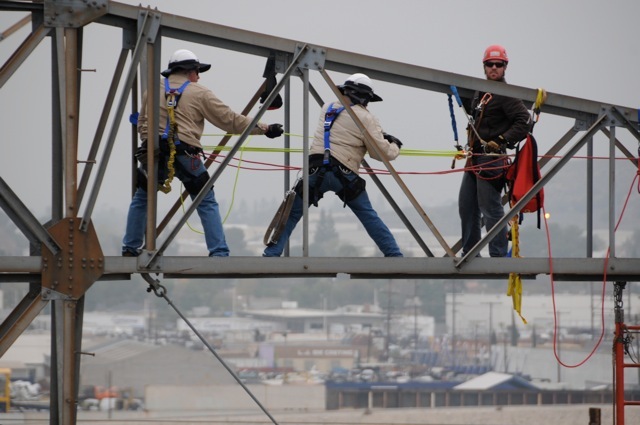 On dead end structures, crews wanted to transport the victim from the "hot" side of the dead end yoke at the end of the ladder to the towers foundation. 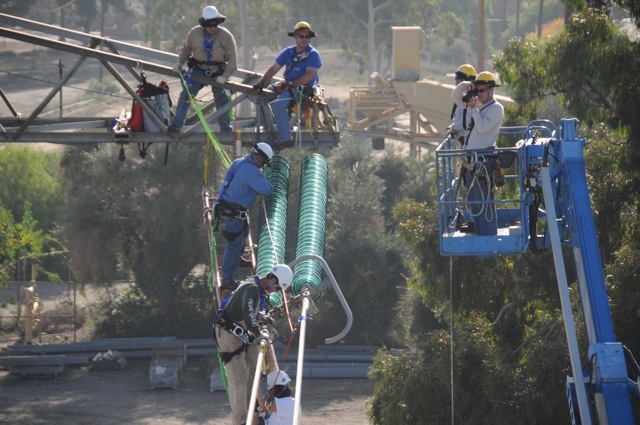 A tracking line rigged off the conductor bundle was used for this purpose by LADWP linemen. Wade Hildebrand sits on twin bundle 2312 from the Pacific NW-SW Intertie DC line ready to begin a rescue. 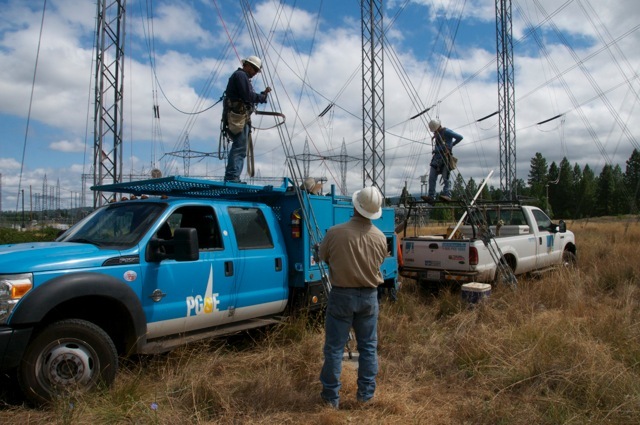 Line crew members rescue coworkers off of a dead end ladder system on the Pacific NW-SW Intertie DC line. 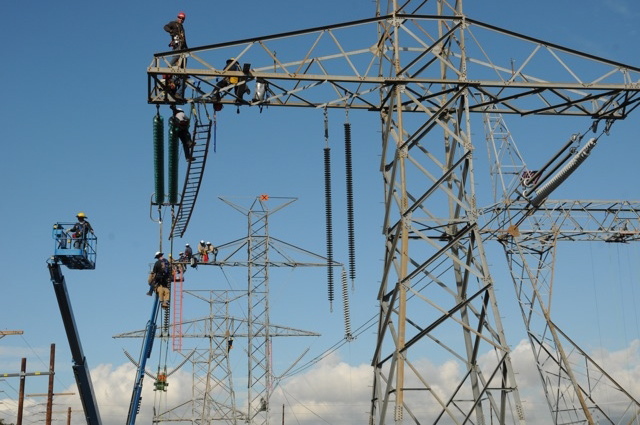 View of training towers for LADWP at the Valley Generating Station in Sun Valley. 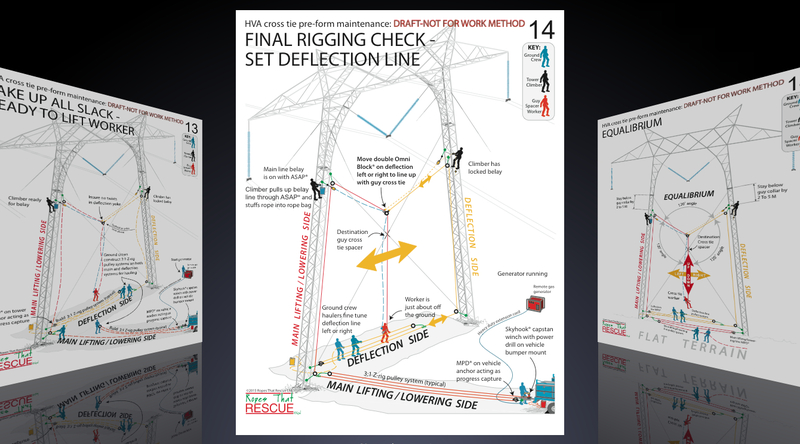 The Ropes That Rescue training occupied all three of the towers seen in this photo at the same time. 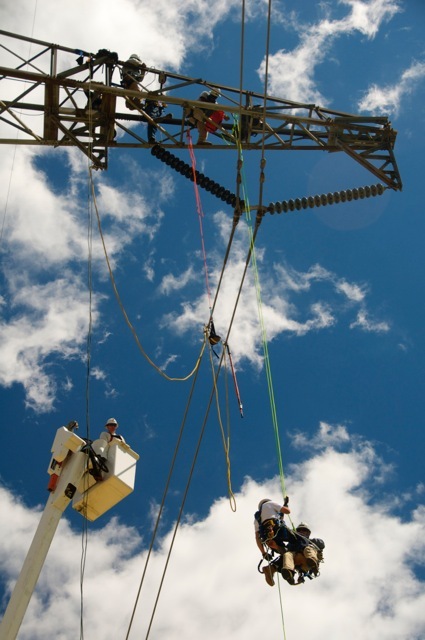 LADWP linemen on the bridge of the IPP (Intermountain Power Project) DC line use an AZTEK kit to lift an injured victim off the conductor tri-bundle below. 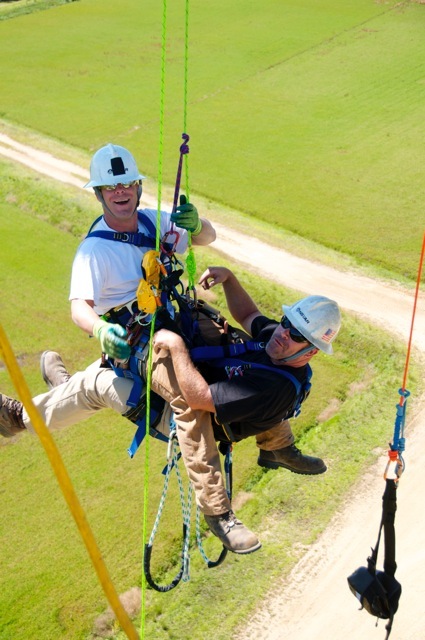 RTR instructor Luke Thorne in red helmet watches rescue. 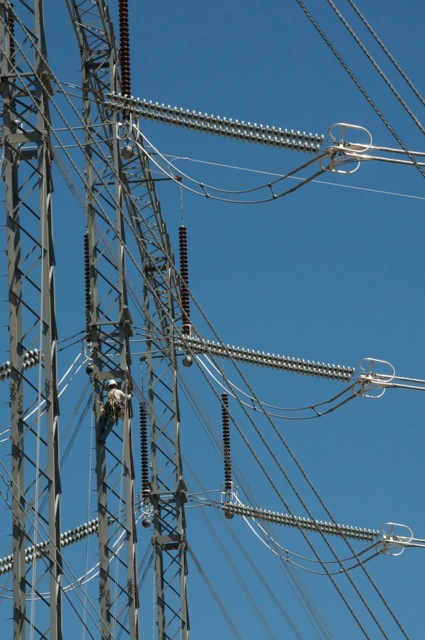 View of Intermountain Power Project taken from the ground. 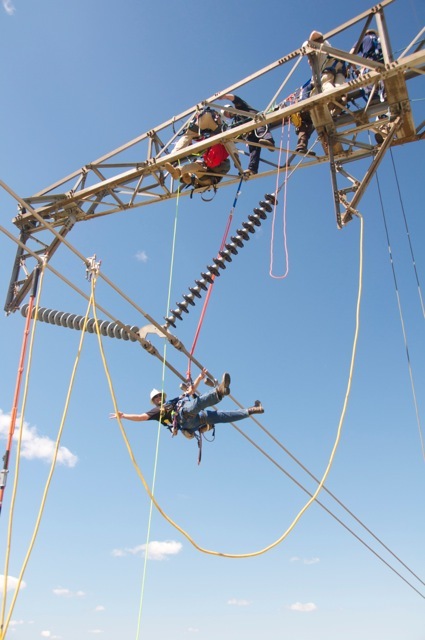 Rescue off of tangent tower of the IPP (Intermountain Power Project) DC line use an AZTEK kit to lift an injured victim off the conductor tri-bundle below. 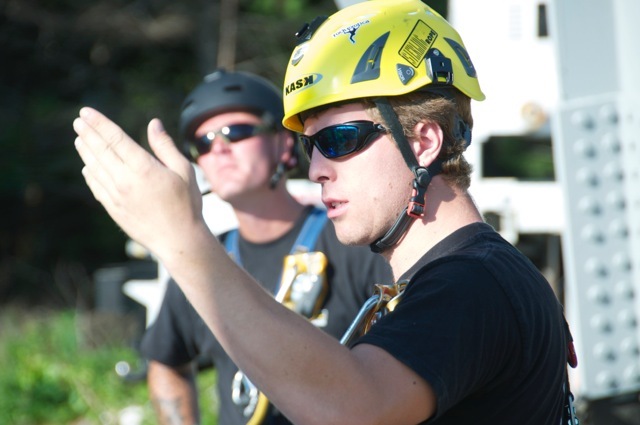 RTR instructor Luke Thorne in red helmet watches rescue. 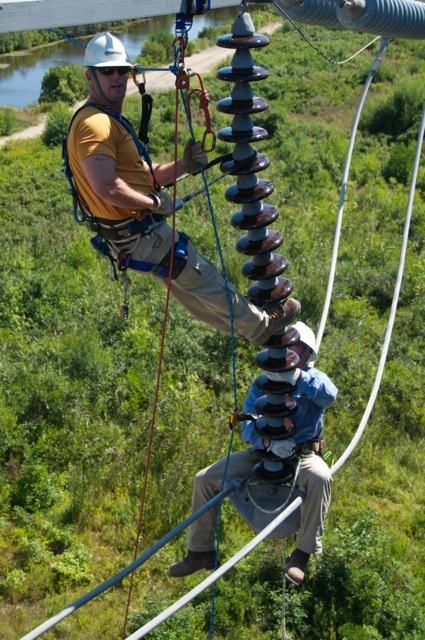 Rescue from the cold end of double barrel V string insulators on the IPP line. 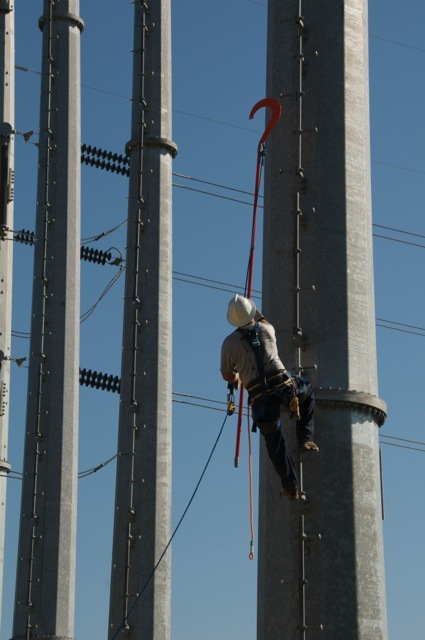 RTR Instructor Luke Thorne rappels off man lift while LADWP linemen above prepare for pick off rescue. 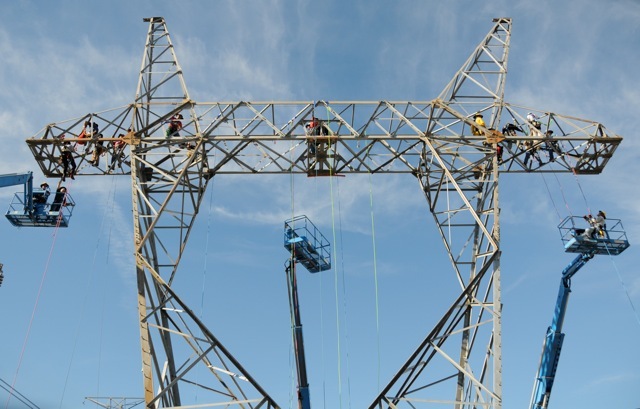 A 500kv dead end tower with three "stations" for teaching the LADWP linemen on structure-based tower rescue.